While this sweater was not quite ready in time for Rhinebeck festivities as I had hoped, I was knitting the neck that weekend and had completed the knitting portion of the project just a week or or two later. Then I did what I often do with knit projects – I let it sit in a bag somewhere in our apartment with the ends waiting to be woven in for the next few months. It was marinating, of course! Other projects came up, and then I was pregnant and tired so I couldn’t stay up to do it, and then more projects came up, and then… and then… and then…. Blerg. You know the song and dance. But lo! It is done! The hood has been kitchener-stitched (hastily), the armpits also (shoddily), and all those yarny bits have been woven in (finally!). Which is great timing since it fits the kiddo *just* right. I’d say he’ll get a few weeks of wear out of it before it’s too small. Being as it’s a lovely cotton/wool blend, it’ll be the perfect sweater for this whackadoodle spring we’re having where it’s 80º F one day and 40º the next. That Spud & Chloe Sweater yarn is so freaking fantastic. 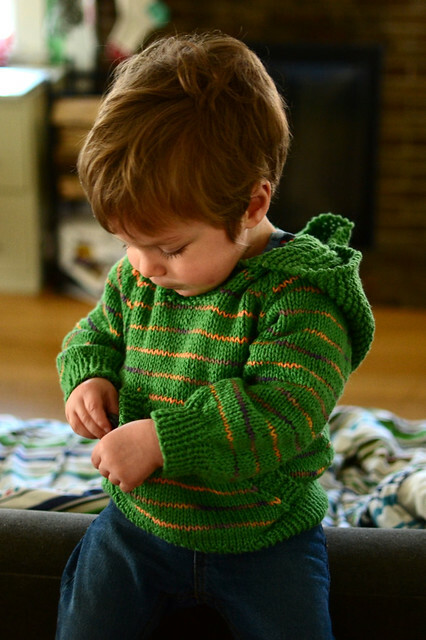 I want to knit all the kiddo knits with it. It’s is squishy, soft, and sproingy, and I love this shade of green immensely. The pattern itself is a breeze. As much as I appreciated its clarity, I also enjoyed the conversational tone in which it was written. It’s very EZ. And really, any pattern that instructs you to “treat yourself” is my kind of pattern. My only challenge was that I tried to integrate the instructions for striping as on the purl bee for the size I was doing which must have been different from theirs as I was coming up with slightly different numbers, hence different striping results. I managed to keep the stripe spacing at four rows, but that entailed some finagling when I started the raglan decreases at the shoulders and when I stopped knitting in the round for the neck opening. If that sounds confusing, it’s because I was completely confused. Not that it was a big deal as I was able to keep it up with the striping, but it was just a little frustrating to have two ends of the contrasting Koigu going at once in order to maintain the spacing. Maybe I overcomplicated things; I’m not sure. Not to perpetuate the whole “pregnancy brain” bull, but my thinking was not as clear or rational as I would have liked at that stage in the pregnancy. The hormone fluctuations were doing something unfunnily funny to my logic. Next time I knit a Wallaby, and there will be a next time since this is so cute and easy, I’ll use either a solid or a self-striping yarn. I’m not going to bother striping it in that manner again, as pretty as it looks. The best thing about this sweater, though? The kiddo’s fascination with the pouch. He kept shouting, “Pockets!” during our little photoshoot. Makes me happy to see him appreciating something I made for him! Cute! I love when a project comes together so well.